Liz Adair is a master at creating delightful and intriguing characters. I loved every character in the book and kept guessing and pondering on who was trying to kill Mandy and who she was going to fall in love with. The setting of this book is delightful, the town one that I would love to visit. 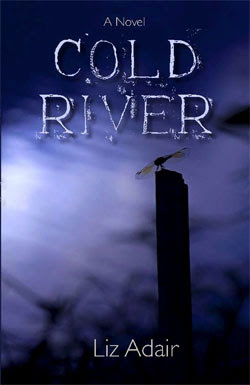 Cold River is another well-written book by Liz Adair. What I liked: Loved the people, the setting, and the author's voice. What I didn't like: I wouldn't have touted the book as a suspense. The plot was definitely intriguing and well-done but from the publisher's description I was looking for more suspense. Audience: I would recommend this book to everyone. Where to buy Cold River: Amazon or Deseret Book. Check back tomorrow, I'll be posting a giveaway of Cold River. What a fabulous Christmas present that would be! Hmmm I often find what the publisher says and what the book is are often completely different. Excellent review, Cami, you inspired my curiousity about the book. And all the best to Liz Adair on her new release! Thanks Debby and Karen for stopping by. I just realized I titled this post wrong. Sorry! Thanks, Cami, for reviewing Cold River. And thanks for posting a link to my blog. Thanks, Liz for stopping by. Kari, it's great to hear from you! I'll enter you in the drawing.